Most of us take our house gutters for granted. But they have a tough job to do — especially in the winter. Winter snow and ice can wreak havoc on your gutters! Even if you keep your rain gutters clean and in good shape, problems such as ice buildup, ice dams, and icicles can still cause major structural damage to your home. Yes, even gutters that are properly installed and of the best quality will strain under heavy snow loads and brutal ice. Here are 5 things you can do to your house gutters to help them work more efficiently — especially through the winter months! #1 – Install gutter guards. Gutter guards reduce debris — like autumn leaves and winter snow accumulation — which can cause blockage or weight-bearing damage to your rain gutters. No gutter guard is perfect, though. Even high-quality gutter guards can’t completely prevent accumulation — so regular gutter cleaning and inspection are still recommended. Experts weigh in on the pros & cons of installing gutter guards. #2 – Add heating elements to your house gutters. Gutter heating cables will melt snow and ice, preventing buildup and ice dams as well as decreasing the weight load on your gutters. How? The gutter heaters keep the water above freezing in both the gutters and the downspouts – allowing it to flow freely away from your house. TIP: Heating cables and gutter heating systems should come with thermostatic controls so you can just flip a switch to turn them on when necessary, preventing overheating and excessive electricity use. #3 – Improve your attic insulation and venting. Heat from inside your home causes snow to melt on the roof. The subsequent runoff may refreeze in your gutters — eventually building up and causing destructive ice dams. So you ultimately want to keep your roof cold in the winter months. By making sure that space has adequate ventilation. Doing those 2 things will significantly decrease the heat buildup and snow melt from your roof. #4 – Reinforce your gutters with bracing hardware or gutter brackets. Even properly installed house gutters can fail during a heavy snowfall — unless you add some additional support. Reinforce the existing anchors to increase the gutter’s load-bearing capacity. Decrease weakening of the gutter or outright structural damage from too much weight. #5 – Add an ice & water membrane to your roof. Ice and water barriers installed in your home’s roofing system will help prevent damage caused by moisture. Most houses have ice and water membranes installed underneath the shingles of the roof during the construction phase. However, even if yours is an older home, you may benefit significantly from an upgrade to the roofing system. When you’re faced with a blizzard, ice storm, mounting snow, and bitter chill, the last thing you want to do is get up on the roof to do major repairs. By using some or all of these gutter aids, you can reinforce the strength and efficiency of your home’s gutter system. Now your gutters will be strong enough to endure even the harshest winter! 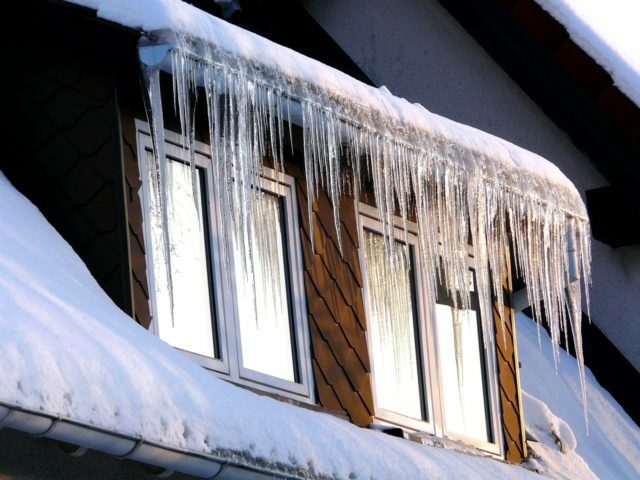 Will A Metal Roof Avoid Ice Dams?